Before continuing with the description of the Bethlehem Seminary by JUDITH SARGENT MURRAY, let me include a few words about the Seminary’s origins. 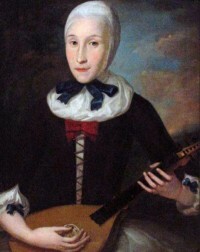 It was Henrietta Benigna Justine Zinzendorf von Watteville (1725-1789), born in Berthelsdorf, Saxony, the daughter of the founder of the Renewed Moravian Church, who when she came to America with him at age sixteen was encouraged to open a girls’ school. This she did in 1742 in Germantown, Pennsylvania; the school moved to Bethlehem, the center of the Moravian Church in America, in 1749. The first boarding school for girls in America, it welcomed Indians, and in 1785 opened its doors to those not of the Moravian faith. It quickly acquired such a reputation that George Washington personally requested admission for his great nieces. The Countess visited frequently and remained involved with the Seminary throughout her life. The Seminary evolved through the years and in 1953 became part of the coeducational Moravian College at Bethlehem. Judith Sargent Murray continued her observations on the Seminary. Do you not think the tears gushed in the eyes of our Murray—Do you not believe that my heart swelled with transport? . . .
Bonnie Hurd Smith, the founder of The Judith Sargent Murray Society, has transcribed and published Murray’s letterbooks. See the complete letter HERE. Information on the Seminary’s founder can be found HERE. The portrait is of the Countess with a cittern and was found HERE..